Eat ants, termites and underground fruits. 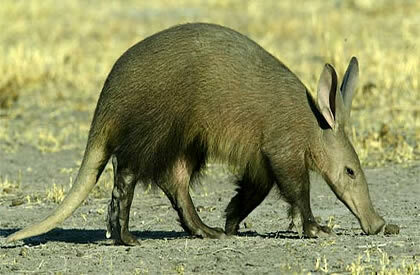 Can be found in Africa, south of the Sahara. Live in savannahs, woodlands, grassy plains and bush country. Burrow ... and they can dig a burrow in just a few minutes. Prefer sandy soil and they live in 2-20ft burrows that they dig only at night. Dig a hole outside their burrow for their dropping, in order to keep the burrow safe and clean. Abandoned burrows are often used for shelter by other animals. When leaving the burrow, they block the entrance. Males are mostly nomadic and the females are more territorial. Can hear and smell termites and ants.